Please click here for: for anti-aging and repair products for the skin, gair groeth, circulatory system, joints, muscles, digestive organs, mental apparatus, body appearance and general condition. Natural drugs for all common ailments, including edema, hypothyroidism, hemorrhoids, poor memory, allergies, UTI, cold, flu, depression, rheumatism, heart and circulation issues, skin problems, digestive trouble, over-weight. Back to main menu - boat models, car models, rc robots, electronics, chemistry, binoculars, microscopes, other hobby and professional items. Welcome to this online presentation of quality microscopes to be used for professional applications, education and hobby works. Please click on a link to learn more or to buy. You will also find many more microscopes and otical instruments to select from by clicking at the links than those here presented. There are also all types of microscopy accessories, like object glasses, cleaning equipment and object preparation tools. Please scroll down to read about some organisms you can see through a microscope. The microscopes exhibited at this page are mostly digital microscopes for hobby and educational use. Please scroll down to read about how to prepare an object for microscopy. The digital microscopes are of two kinds. One kind has a digital screen at the top of the microscope so that you can look at the image just like you look at a TV or a computer screen. The other type do not have any screen or eyepiece of their own, but communicate by wire or by bluetooth connection to your computer and the image is shown at your computer screen. These microsopes also come with a program to install at the computer that make it able to show the microsope image and manipulate the image in several ways. Some advanced microsopes have both ways of presentation. Zooming of an image to get higher magnification in a digital microscope can be done by two ways. One way is optical zooming. This is actually the best way, since optical zooming allways secures a sharp picture with the full number of details. The other way is digital zoom. Digital zoom will allow you to further magnify the spot you are particularly interested in, but the picture will loose details and look smeared out or blurred at a certain point. Digital microscope with a high resulution at the recording plate will however make good pictures also by a fairly close digital zoom. Barska's Digital Microscope with 3.5" LCD color screen and 10x eyepiece gives you the option of viewing the specimen through the screen or through a traditional 10x eyepiece. It's like having two microscopes in one. Screen module is packed with features that manipulate images and videos. Images and videos can be saved on the internal 128MB memory, expand the memory up to 8G with the external memory SD/MMC slot or transferred to a computer through the USB cable. Features a specimen holder with mechanical stage. The specimen holder keeps the specimen slide in place and can smoothly move the slide back and forth as well as from side to side. Levenhuk D70L Digital Microscope can be used for studying both transparent and opaque objects in transmitted light using the bright field method. This microscope is ideal for biological researches or teaching demonstrations it s very convenient to study samples in a group of students they can see it on the 3.6 LCD display in a real time.All optical elements of this microscope are made of high-quality multi-coated glass that s why with Levenhuk D70L Digital Microscope you will be surprised by sharpness and brightness of produced images. Microscope produces increase of 40 100 and 400x.This model integrates two light sources which provide sufficient illumination even while working in a dark room. Using Led illumination allows you to reduce energy consumption. LCD Digital Microscope with a high resolution 3.5 LCD display. LCD bright screen creates clear viewing of microscopic worlds. The microscopes three objective lenses provide 40x 100x and 400x optical magnification. The 4x digital zoom allows you to view objects at up to 1600 times their original size. LCD Screen with 4x digital zoom. Built-in digital camera 2 mega pixels Acts as 10x eyepiece. Top and Bottom LED illumination. 512 MB internal storage memory. SD card slot. Five prepared slides. Six position color filter wheel. USB cable for transferring images to a PC. AC adaptor to power the microscope and carrying case included. 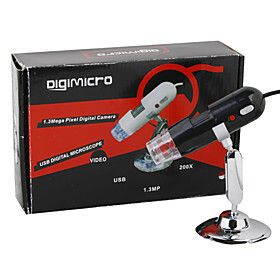 Digital USB microscope with image capture facility. 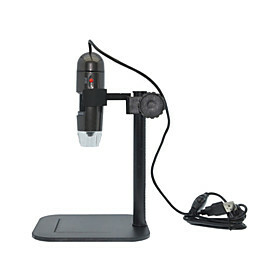 The zPix 300 MM-940 from Carson is a powerful 2 megapixel zoom USB digital microscope that displays a magnified image right on your computer screen. The impressive 86x-457x power zoom magnification allows you to see details of ordinary objects that you never knew existed! Capture an image to keep with the click of a button. You can even capture close focus video and send it to your friends and family. Use the base attachment to view prepared slides or remove the base and place the microscope on any surface to reveal extremely fine details. The zPix 300 USB digital microscope will provide hours of fascinating and educational entertainment for adults and children alike. The zPix 300 MM-940 Zoom Digital Microscope is compatible with the following: Mac OSX 10.4 or later PC with Windows XP Windows Vista Windows 7 and Windows 8. A USB 2.0 port is required. Dimensions - 3.1 x 3.5 x 5 in. A handheld digital microscope that provides ultra-clear images on your PC with an USB connection. Check for microscopic board damage, component numbers, traces, and more. Even take on-screen measurements with included software. This handheld USB microscope lets you look at anything under magnification, and also functions as a USB webcam. The PortaTrace PORTASCOPE Handheld Digital Microscope is shaped much like a typical writing instrument making it rather easy to use intuitively almost immediately. Powered by LED illumination which you can continually adjust with a small dial near your fingertips the PortaScope zooms from 10X to 200X and usually provides more working distance between you and the subject than many of the digital microscopes.A clear protector on the front of the device intends to prohibit accidentally bringing your scope into contact with your specimen. The PORTASCOPE comes with Windowsbased software and its output via the USB cable is a standard 1280 x 1024 resolution file. Though PortaScope was designed for handheld use first it does also come with a dedicated stand. New Innovation from Celestron A handheld digital LCD microscope with a 2.4 LCD screen. With the builtin digital camera (3MP) you can take snapshots or video using the builtin flash memory of 128MB or use an optional SD Card and then later upload your images to your computer. Great for viewing or capturing objects such as insects plants stamps coins rocks currency relics circuit boards and much more. Features:. 2.4 LCD Screen Panel. Builtin Digital Camera 3MP (snapshots up to 12MP with interpolation). Image Capture Capability Snapshots. 4x Digital Zoom. Optical Power 3.5x and 50x (digital power review approx. 25x and 225x on a 17 monitor). 128MB Internal Flash Memory. SD Card Slot (uses optional SD Cards up to 8GB). Focus Knob. Adjustable LED Illumination. USB 2.0 Cable (used to upload images to a computer). Carry Pouch. Battery powered for field use or in the home uses 2AA batteries (user supplied). Weight 6.5 oz (187 g). Dimensions 3.8 x2.5 x4.2 (96 mm x 63 mm x 107 mm). A Digital Microscope In The Palm Of Your Hand Now you can get a closer view of the world around you with this Digital Microscope. This digital microscope is stateoftheart integration of high quality optics and digital camera. This type of microscope is used for closer viewing of the nonmicroscopic world through your computer screen. Uses such as collectors to analyze or inspect gems coins stamps insects and plants. Industry uses include inspection and analysis of electronic components metals textiles plastics jewelry and geology. Medical applications include analysis of specimens as well as everyday medical research. 10x300x Zoom Magnification. Powered by a high speed USB 2.0 cable to a PC or laptop computer. To find telescopes for astronomy and lasdscape view please click here. To find binoculars and monoculars for day and night vision, binocular and monocular cameras for day and night vision - please go here. General stores for hobby products of all kinds - and many professional grade electronic products - also microsopes - By clicing at these banners you will find many helicopter and aircraft models, and also a lot of other articles, for example: Hobby chemistry equipment, hobby electronic equipment, professional electronic components, car models, boat models and metal detectors for hobby and professional use. 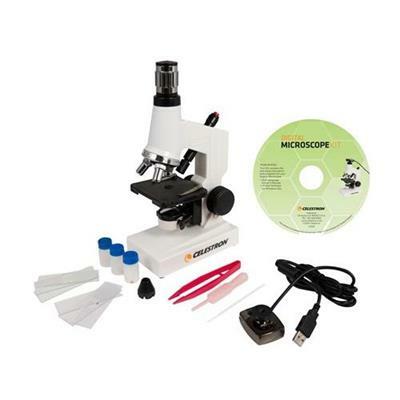 You will also find scientoific kits and instruments for hobby use, like microscopes. A general law price warehouse with many microscope moels - This is a general warehouse with all kind of techical products, including many microscope models for hobby and professional use. You can also find fashion, body care products, apparael and home equipment here. Comodities to use in your car - also a lot of tools to use on cars and on any other work - By clicking at this banner, you will find a huge collection of commodities for your car or to bring with you on your journeys, like electronic equipment, luggage bags, security items, navigation units, workshop tools and a lot more. Also technical equipment. This is a phylum of monocellular organisms that have a lot of small hairs (Cilia) on the body. Those are either usd for movements of to catch foof into the mouth. The mouth is usaully a funnel-shaped opening some place on the body. The dhape of the organsims vary very much. They behave in a lot of ways. Sometimes they move by using the cilia. Sometimes they are fastened to some object by a foot. Sometimes they are makeing streams with the cilia that catch food into the mouth. The cells have a lot of structures you often can see. There is the mouth, the cilia, two cell kernels ( a big and a little), apulsateing vacuole. The vacuole is a bladder that fills and emoties steadily to take away weter that constantly diffuses into the body and to remove vaste. The heterotrichs are a class of ciliates. They typically have a prominent adoral zone of membranelles circling the mouth, used in locomotion and feeding, and shorter cilia on the rest of the body. Many species are highly contractile, and are typically compressed or conical in form. These include some of the largest protozoa, such as Stentor and Spirostomum, as well as many brightly pigmented forms, such as certain Blepharisma. The Picture shows Stentor Roeseli, a spesies in this class. The Amoebozoa are a major group of amoeboid protozoa, including the majority that move by means of internal cytoplasmic flow. Their pseudopodia are characteristically blunt and finger-like, called lobopodia. Most are unicellular, and are common in soils and aquatic habitats, with some found as symbiotes of other organisms, including several pathogens. The Amoebozoa also include the slime moulds, multinucleate or multicellular forms that produce spores and are usually visible to the unaided eye. Amoebozoa vary greatly in size. Many are only 10-20 μm in size, but they also include many of the larger protozoa. 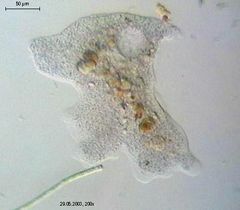 The famous species Amoeba proteus may reach 800 μm in length, and partly on account of its size is often studied as a representative cell. Multinucleate amoebae like Chaos and Pelomyxa may be several millimetres in length, and some slime moulds cover several square feet. The Amoeba proteus is an amoeba closely related to the giant amoebae. It belongs to the Rhizopoda, more specifically to the Phylum Sarcodina. This large protozoan uses tentacular protuberances called pseudopodia to move and phagocytosize smaller unicellular organisms, which are enveloped inside the cell's cytoplasm in a food vacuole, where they are slowly broken down by enzymes. The Amoeba proteus possesses a nucleus containing granular chromatin, and is therefore an eukaryote. The dinoflagella are a large group of flagellate protists. Most are marine plankton, but they are common in fresh water habitats as well; their populations are distributed depending on temperature, salinity, or depth. About half of all dinoflagellates are photosynthetic, and these make up the largest group of eukaryotic algae aside from the diatoms. Being primary producers make them an important part of the aquatic food chain. Some species, called zooxanthellae, are endosymbionts of marine animals and protozoa, and play an important part in the biology of coral reefs. Other dinoflagellates are colorless predators on other protozoa, and a few forms are parasitic (see for example Oodinium, Pfiesteria). Dinoflaggelates have flagella. those are long extending tubes that can be moved in various ways and that they use to move themselves. Dinoflagellates also have cloroplasts with clorophyll, making them capable of photosyntestis, that is making complex molecules from CO2 and water with releasing of oxygen and by using energy from the sun rays. Most dinoflagelates are unicellular forms with two dissimilar flagella. One of these extends towards the posterior, called the longitudinal flagellum, while the other forms a lateral circle, called the transverse flagellum. In many forms these are set into grooves, called the sulcus and cingulum. The transverse flagellum provides most of the force propelling the cell, and often imparts to it a distinctive whirling motion, which is what gives the name dinoflagellate refers to (Greek dinos, whirling). The longitudinal acts mainly as the steering wheel, but providing little propulsive force as well. The rotifers make up a phylum of microscopic and near-microscopic pseudocoelomate animals. They were first described by John Harris in 1696 (Hudson and Gosse, 1886). Leeuwenhoek is mistakenly given credit for being the first to describe rotifers but Harris had produced sketches in 1703. Most rotifers are around 0.1-0.5 mm long, and are common in freshwater throughout the world with a few saltwater species. Rotifers may be free swimming and truly planktonic, others move by inchworming along the substrate whilst some are sessile, living inside tubes or gelatinous holdfasts. About 25 species are colonial (i.e. Sinantherina semibullata), either sessile or planktonic. Rotifers get their name (derived from Latin and meaning "wheel-bearer"; they have also been called wheel animalcules) from the corona, which is composed of several ciliated tufts around the mouth that in motion resemble a wheel. These create a current that sweeps food into the mouth, where it is chewed up by a characteristic pharynx (mastax) containing tiny jaws. It also pulls the animal, when unattached, through the water. Most free-living forms have pairs of posterior toes to anchor themselves while feeding. Rotifers have Bilateral symmetry Rotifers have a variety of different shapes. There is a well-developed cuticle which may be thick and rigid, giving the animal a box-like shape, or flexible, giving the animal a worm-like shape; such rotifers are respectively called loricate and illoricate. Like many other microscopic animals, adult rotifers frequently exhibit eutely - they have a fixed number of cells within a species, usually on the order of one thousand.